Last Thursday Take to the Road attended the inaugural City Concours in London. Nestled in the grounds of the Honorable Artillery Company, this new concours event is the precursor to the Concours of Elegance (which will be at Hampton Court Palace in September). The new City Concours show in London is set to be a major feature. An impressive collection of vintage, classic and modern supercars were gathered together for a very unique event in the heart of London. All the cars were specially selected for the show and there was some very special and rare classics on display. The HAC grounds are a perfect setting for a concours event. Some big guns from the classic car world were on display. As always is the case with a show of this caliber, it is very hard to know where to start, such was the quality of cars on display. First of all the setting itself in the grounds of the Honorable Artillery Company was perfect. If you have never been there before, it is a tranquil, green open space in the heart of a very busy and crowded London. The perfect place for a high quality concours event. HRH Prince Michael of Kent, Patron of the Concours of Elegance, was at the inaugural City Concours. The selection of cars on display was very impressive with exotic and rare examples of some of the worlds greatest marques looking resplendent on the immaculate lawn. The 1969 Jaguar E-Type by Eagle. A stunning take on the Low Drag E-Type. And of course there were many favorites, almost too many to count. The most notable cars were a wonderful 1952 Ferrari 212 Inter Vignale, a stunning 1962 Maserati 3500 Spyder Vignale, a striking 1972 Ferrari 365 GTB/4 Competizione Series 3, a bullish 1973 De Tomaso Pantera GT5, a legendary 1975 Lancia Stratos, an iconic 1994 Bugatti EB110 GT and the very special 2016 Alfa Romeo Disco Volante Spyder by Touring. Every classic car concours event has to have a Lancia Stratos. 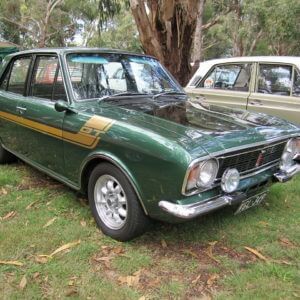 And this 1975 example was impressive! One of our favorite classic era muscle cars, the De Tomaso Pantera. An awesome car. This rare 1973 Porsche 911 RS Touring ticked a lot of boxes. Continuing with the Italian theme, this 1994 Bugatti EB110 GT was stunning. Another firm Italian favorite was this gorgeous 1962 Maserati 3500 Spyder Vignale. With so many wonderful classics to choose from at City Concours, it was a tough decision to pick one as the over all best in show. But after much thought and deliberation I did choose one. For me it was the Ferrari 365 GTB/4 Competizione Series 3. First of all it was hard to miss with its yellow paint and impressive racing livery. It really did stand out from the crowd. But it was the combination of the graceful lines of the iconic Daytona coupled with the aggressive racing look that sealed it. It really was beauty and the beast. The ultimate Daytona and our top car from the inaugural City Concours. What a machine! This Ferrari 365 raced at Le Mans. The side exit exhausts give this Ferrari a touch of hot rod. Not something normally associated with a luxury V12 GT! It maybe a racer but it still retains the gorgeous lines of the 365 GTB/4. 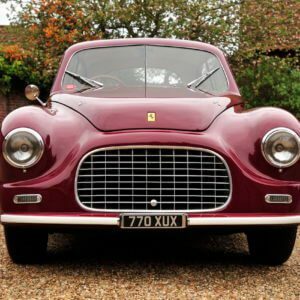 Coming a very close second (and I mean very very close second) was the utterly charming 1952 Ferrari 212 Inter Vignale. This car was at the London Classic Car Show back in February and it was fantastic to see it once again, this time in the open air away from the harsh lights of the ExCel Centre. The stunning Ferrari 212 Inter. The two tone paint and the rear fins are not styles usually associated with a Ferrari. But they work! This car is in amazing condition and is mostly original, which is incredible for such an early Ferrari. The smell alone wafting from the leather clad interior was just divine… its something you have to witness for yourself. With Ferrari’s 70th anniversary this year, it is a privilege to see some of the marques early road cars on display. And this one is very special indeed. This car was originally sold in America and has since made its way to the UK. The interior of this Ferrari 212 Inter is wonderful. 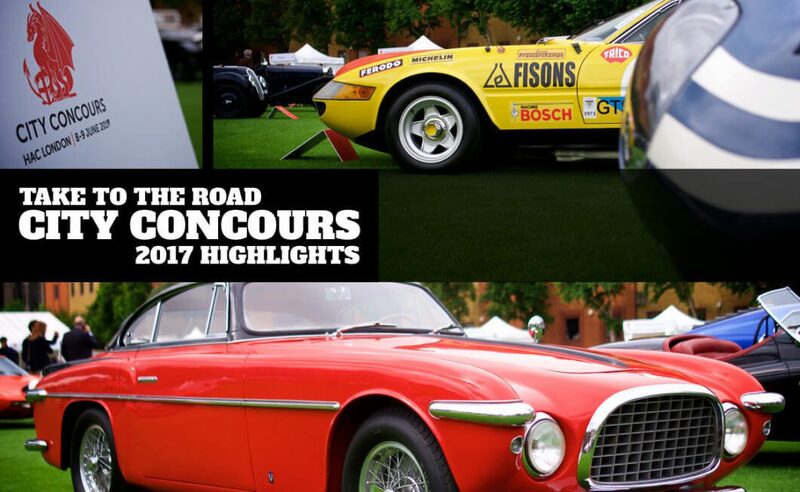 So that is a wrap for Take to the Road’s Highlights from the 2017 City Concours. It was a very successful opening for the new event with some of the best classics in the UK on display. It will be back in 2018 at the HAC (7-8th June). Without a doubt this new show will become a firm favorite on the concours calendar and Take to the Road will be there in 2018!